Slide 2 GartnerBI analyst JoshParenteau: BI MagicQ: "buyers are buying ease-of-use: Tableau, QlikView & TIBCO Spotfire are easy to use"
The recent Gartner BI Bakeoff: See Winner of the BI Bake Off, The BI Bake Off Comes to Gartner, and Gartner Business Intelligence & Analytics Summit, led me to do a Proposed Meetup June 1st: Data Science for Homelessness Data with Spotfire, and invite QlikView and Tableau to participate. Please note that I did quick tutorial slides below for Tableau since their representative had a last minute scheduling problem and we will hopefully have them at a future date since other BI Platforms have expressed interest as well. The winner of Gartner’s first BI Bake Off was …. it was a tie! Or more accurately, the winner depended on whom you asked and what their requirements were. This is, of course, as it should be. I mean, it’s like having Rita and I sample chocolate cake and fruit tart and asking us to pick the winner. I will choose chocolate, every time. Rita, the fruit tart. Meanwhile, Kurt wouldn’t choose either because he’s a mint chocolate chip ice cream man! With the BI Bake Off, our goal is to have you think about your requirements as we help reveal the strengths and weaknesses of each product. Visual data discovery tools all fit in the same BI category (just as cakes and pies are desserts), but their differences in architecture, analytic power, data connectivity, use of visual perception and ease of use all vary substantially. There were some amazing discoveries with the data and business question. We asked the vendors to use the same sample data on shelters, homelessness and population trends, facilitated by Posiba, an organization that helps charities leverage data. The data was somewhat messy, a norm for anyone dealing with external data, acquired companies, and so on. But it’s a departure from BI tools that access nice, cleansed data in a central data warehouse. State and county information was stored in one column that needed splitting, counties combined facilities over time, and years were in multiple tabs on spreadsheets. This kind of messy data is why we are seeing a rise in start ups for self-service data preparation tools as well as so many data discovery vendors baking this into their products (check out the Market Guide for Self-Service Data Preparation and Best Practices in deploying). 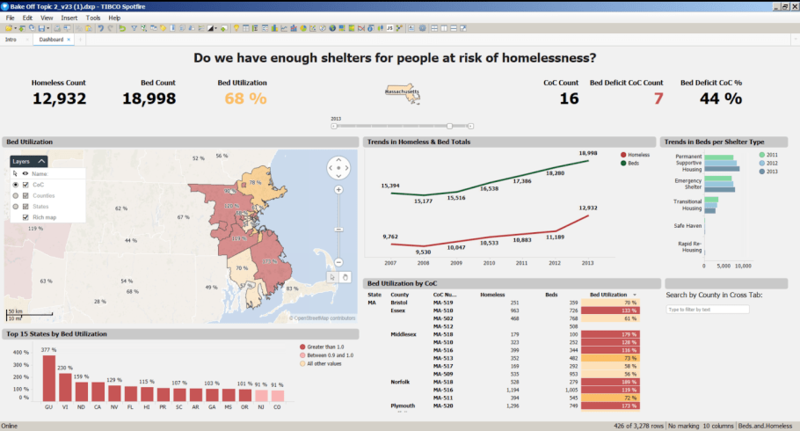 The SAS dashboard showed the differences in number of beds in shelters versus homelessness. California has the biggest lack of shelters, but it has shown modest improvement. Michigan meanwhile seems to have closed the gap. I wonder if this is at all related to differences in climate in each state? In the last demo topic, we let the vendors choose a cool innovation to showcase, and Tableau chose to publish live to the cloud so that anyone can explore homelessness in their own state, here. As a New Jersey girl, I was disheartened to see the shifts in homelessness by county following hurricane Sandy where homes and shelters were damaged or destroyed, and more people needed temporary housing. Union County, for example, has one of the highest portions of homeless children. Answering the business question is job one, and technology enables that. Sometimes we have to dig under the covers to see which tools provide the right fit and how they work. Qlik focused on governance, and you can read more on their blog here. While we had some technical difficulties during the bake off with the video (HDMI and 4 panelists seemed a stretch! ), attendee feedback was overwhelmingly positive. So I hope this track will become a mainstay at future Gartner BI summits. Beyond the bake off, if you are looking for analyst opinion on the strengths and weaknesses of many more BI vendors, I see that our new “Critical Capabilities for BI and Analytics Platforms” is in final edit. So watch Twitter or create an alert on Gartner.com for when it publishes! I’m hoping any day now! Yep, a real live BI bake off among four arch competitors: Qlik, SAS, Tableau, and TIBCO! It’s a first for the Gartner BI Summit, and I hope you will be able to join us March 29, 1 p.m., in Las Vegas. I’ve been facilitating bake offs for customers and at events such as TDWI and DAMA for several years now. It is a high-action, visual way to get a side-by-side comparison of leading visual data discovery products. The bake off is somewhat terrifying – for vendors and for me – but it’s great for BI buyers. I mean, really, would you rather wade through more paper-based RFP responses? I didn’t think so! In the bake-off, vendors adhere to scripted demo topics that we’ve selected to best reveal each product’s strengths and weaknesses. And here is a new twist I love: we’ve asked vendors to use a consistent sample data set to allow for clearer comparisons. We’ve partnered with Posiba, an organization that uses data to support charities. For this bake off, we will be using data on homeless shelters, at risk individuals, and Census data. So it’s an educational event as well as a way to use BI for a greater good. We are limited on time so could only invite four vendors to the main session, but a number of vendors in the exhibit hall will also be participating via scripted demos and the sample data set at their booths. Live polling allows attendees to vote by use case and criterion on which product best meets your needs. As the facilitator, I’ll let you know where Gartner agrees on particular strengths, or where the demo might have looked better than what we our research finds. This first bake off will focus on visual data discovery that’s driving much of the current BI buying, confusion abounds, and we’ve seen rapid innovation. If this first bake off goes well, I hope we will be able to add future sessions on particular focus areas. I look forward to seeing you there, and if you can’t attend in person, watch the tweet stream #GartnerBI. I will try to emulate this. How about our doing a Federal Big Data Working Group Meetup June 1st on Data Science for Homelessness Data with Spotfire? 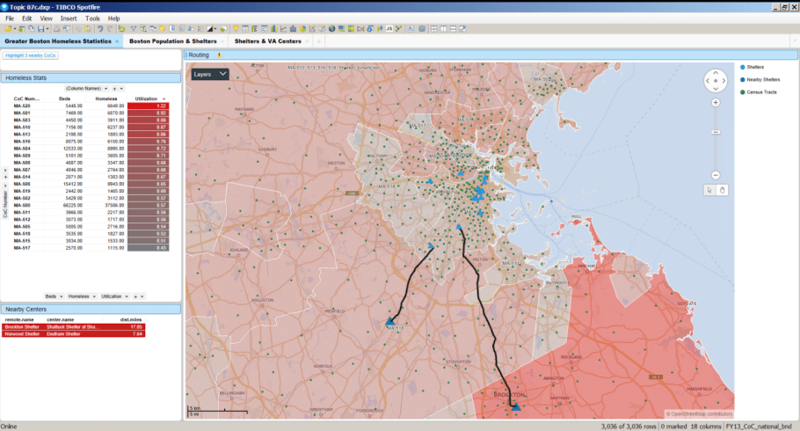 Hello, Just thought you both should know that you have made requests for suggestions for Spotfire analysis of homeless data (Michael) and participation in a Census Webinar on April 11th (Rich). Below is the initial search for data sets and the Linkedin dialogue. I can develop this into a Meetup as well. Chief Data Scientist at TIBCO Software Inc. I hope this finds you well ! Michael, I am well thank you. Do you have a data set that I could look at? Do you have Spotfire 7? Do you have 30 min tomorrow to discuss? Do you have 30 min tomorrow to discuss? Yes, late p.m. This collection brings together all documents relating to homelessness and rough sleeping statistics. This collection contains statistics on statutory homelessness, rough sleeping and homelessness prevention and relief. Local authorities compiling this data or other interested parties may wish to see the notes and definitions for homelessness which also includes the latest P1E quarterly form and guidance notes. Guidance for local authorities about recording cases where homelessness is prevented or relieved can be found in P1E guidance: homelessness prevention and relief. Copies of previously published statutory homelessness quarterly statistical releases are available on request. Please contact homelessnessstats@communities.gsi.gov.uk to obtain copies. Added Statutory homelessness in England: October to December 2014. Added Rough sleeping in England: autumn 2014. Added Statutory homelessness in England: July to September 2014. Added Statutory homelessness in England: April to June 2014. Added Homelessness prevention and relief: England 2013 to 2014. Added Statutory homelessness in England: January to March 2014. Added Rough sleeping in England: autumn 2013. Data on households found to be homeless by local authorities under homelessness legislation. This file may not be suitable for users of assistive technology.Request a different format. If you use assistive technology and need a version of this document in a more accessible format, please email alternativeformats@communities.gsi.gov.uk. Please tell us what format you need. It will help us if you say what assistive technology you use. This release provides information on the decisions taken by local authorities on homelessness applications and households accepted as owed a main homelessness duty by local authorities. The live tables provide the latest, most useful or most popular data, presented by type and other variables, including by geographical area or as a time series. Figures for individual local authorities are given in tables 784, 784a, 792 and 793. Tables 772, 776, 783, 790 and 791 have been discontinued and are no longer being updated. They have been frozen following the decision made that regional totals should not be published in DCLG statistics with effect from 1 October 2012. The Homelessness Analytics Initiative (HAI)—a collaboration between the U.S. Department of Veterans Affairs (VA) and the U.S. Department of Housing and Urban Development (HUD)—is intended to provide users with access to national, state, and local information about homelessness among the general population, homelessness among Veterans, risk and protective factors for homelessness, services and resources. The aim of the HAI is to empower communities, organizations and individuals with critical information on trends in homelessness, factors related to homelessness, and services in place to prevent and intervene in situations of homelessness. Additionally, the HAI will enable the VA and HUD to plan and allocate resources, and effectively coordinate efforts to address homelessness, by linking and leveraging data held by these two federal partners, and by creating links with other national-, state, and community-level data sources. Chart trends in homelessness over time, explore relationships between social indicators and homelessness, and download tables of data. The Homelessness Analytics Initiative (HAI) synthesizes information from an array of federal government and other data sources. Indicators included in HAI are measured at the state, county or Continuum of Care (CoC) level, although the geography level(s) for which specific indicators are available varies. In addition, the locations of U.S. Department of Veterans Affairs (VA) Medical Centers, and other VA health care clinics/providers are represented as points in the Homelessness Analytics Application, and some limited information about each of these facilities is available in the HAI. Most of the data indicators included in the HAI are publicly available from their respective sources. However, some indicators were calculated using data from one or more data sources. This process was used primarily to create CoC level measures of demographic, health, behavioral health, economic and housing market conditions from county level data sources; and to calculate rates of homelessness. The level of geography at which specific indicators included in the HAI are available varies. This is largely because the various data sources used to create the HAI collect and report counts of homelessness and other economic, housing and social indicators at varying levels of geography, which do not always align with one another. However, as the CoC is the smallest geographic unit at which annual point-in-time counts of the number of persons experiencing homelessness are available, efforts were made to include as many indicators as possible at that geographic level. Unlike geographies such as counties and states, whose boundaries are effectively permanent, the universe of CoCs and their particular boundaries can change slightly from year to year as some CoCs merge with one another, some disband, and others are created. 1 The HAI includes the universe of CoCs that were in existence in 2012, and therefore provides data for all years only for the 2012 CoCs. In addition to the indicators available at the CoC, county and state level, the locations of U.S. Department of Veterans Affairs Medical Centers, and other VA health care clinics/providers are represented as points in the HAI’s map interface. Users can access information about these facilities by selecting a location of interest in the map interface. Planned future updates of the HAI will expand the number of indicators that are available at the CoC, county and state level and will also add other geographies (e.g. Census tracts or block groups). In addition, future updates will enhance the scope of information available about VA Medical Centers/clinics. The data sources used to select indicators included in the HAI are described below. Where possible, links are provided to each data source. The Behavioral Risk Factor Surveillance System (BRFSS) is a telephone-based survey administered by the Centers for Disease Control (CDD) that collects uniform, state-level data on preventative health practices and risk behaviors that are linked to chronic and infectious diseases as well as injuries. BRFSS data are used in the HAI for select indicators of population health and are available at: http://www.cdc.gov/brfss/. The U.S. Department of Veterans Affairs (VA) operates and funds a number of residential homeless assistance programs for veterans experiencing homelessness. Data from the Compensated Work Therapy/ Transitional Residence (CWT/TR), Domiciliary Care for Homeless Veterans (DHCV), Grant and Per Diem (GPD), Health Care for Homeless Veterans (HCHV), HUD-VA Supportive Housing (HUD-VASH), and Supportive Service for Veteran Families (SSVF) programs, were used to obtain information about the number of beds/units in each of these program types. The table below provides a complete list of the indicators that are available in the HAI—with data sources, level(s) of geography and years of availability for each indicator. This table is also available for download in an Excel spreadsheet on the HAI website. Planned future updates to the HAI will expand the number of available metrics and levels of geography. Continuums of Care (CoCs) are geographic units at which providers of homelessness assistance share federal resources and work collaboratively to develop a strategic plan to address homelessness within their jurisdiction. CoCs vary in size and composition and can be comprised of single cities, individual counties, several counties, or entire states. CoCs are also the smallest geographic unit at which the official point-in-time counts of the homeless population are collected and reported by the Department of Housing and Urban Development (HUD). These CoC level counts are then aggregated to provide state, and national estimates of the size of the overall homeless population and homeless sub-populations. As CoCs constitute geographies that often have irregular boundaries, CoC-level indicators of demographic, health, economic, housing and safety net characteristics are virtually non-existent in other data sources. Therefore, the HAI team used county level data to construct the CoC-level measures of demographic, health, behavioral health, economic housing and safety net characteristics that are included in the HAI. County level data sources were transformed into CoC level indicators using a two-step process described below (No transformation was required for PIT estimates of homelessness and housing inventory variables, which were available at the CoC level). Multiple CoCs fell within a single county. After appropriately matching CoCs and counties, the HAI team statistically adjusted the CoCs that fit the second and third types of relationships described above to complete the construction of CoC-level variables from county measures (no adjustments were necessary for the CoCs that met the criteria for the first type of relationship). In the case of the second type of relationship, the HAI team constructed CoC-level variables from county measures by taking either the sum or a population-weighted average of the county measures from all of the counties within a given CoC. Raw counts of the number or persons experiencing homelessness do not account for population size, and therefore have a number of limitations as metrics for understanding the extent of homelessness in a given community. They also make it difficult to compare the severity of the problem of homelessness across communities with different population sizes. Therefore, for each homelessness indicator, the HAI includes both a raw, unadjusted count and a rate per 10,000 persons and per 10,000 persons in poverty. For the indicators of veteran homelessness, the rate is calculated per 10,000 members of the veteran population. Calculating these rate indicators required combining the HUD point-in-time estimates of homelessness (used in the numerator) and American Community Survey data on size of the overall, poverty and veteran populations (used in the denominator). Note that in calculating these rate variables at the CoC level, the 2005-2009 5-Year ACS estimates were used in the denominator for all years for which homeless count data were available. However, in calculating rates of homelessness at the state level, the 1-year ACS estimates from the corresponding year were used in the denominator, with the exception of 2012, where the 2011 ACS state populations were used because 2012 estimates were not yet available. A small number of other indicators included in the Homelessness Analytics Application were constructed in a similar fashion, using data from one source in the numerator and another source (usually the American Community Survey) in the denominator. For indicators that were created using the procedures described above, all data sources used in their calculation are noted in the complete list of data indicators. The forecasting tool in the HAI is based on a series of statistical models that were estimated to examine the relationship between eight homeless outcome variables and clusters of variables in three primary domains of interest: 1) demographic, behavioral, and public health; 2) economic; and 3) safety net. Separate models were estimated for each of the eight outcome variables and each of the three predictor clusters. The results of these 24 statistical models provided “weights” (i.e. regression parameter estimates) for each community level indicator. These weights provide an estimate of how much the homeless outcome variable is predicted to change given a one-unit change (either an increase or decrease) in a particular community level indicator. In turn, these weights are used in the forecasting tool to allow users to view the expected impact on homelessness of changes in one or more community level indicator. More detailed information about the procedures used to estimate these models is provided below. In estimating these models, we applied a natural logarithmic transformation to each outcome variable due to their highly skewed nature. In developing the HAI, we collected a large number of indicators at the county or state level from the sources described above pertaining to the three primary domains of interest (i.e. demographic, behavioral, and public health; economic; and safety net). Given the large number of predictors that were initially collected in each of these domains, we conducted initial variable screening procedures using univariable linear mixed-effects models. Only those variables that were considered to be modifiable, non- redundant with other predictors (r < .80), and had a p-value < .20 from univariable models were included in the multivariable models. Variables were removed from multivariable models if they were not statistically significant in any of the models. After identifying the final set of predictors using the procedures described above, the HAI team estimated a final set of multivariable regression models. Because CoCs are nested within states, data from CoCs located within the same state are not considered to be independent from one another and this clustering violates the basic assumption of independence in ordinary least squares (OLS) regression. Therefore, in estimating the models used for the forecasting tool, the HAI team employed a linear mixed-effects modeling approach (i.e., multilevel modeling) with random intercepts for U.S. states. In doing so, the HAI team stratified CoCs by metropolitan and non-metropolitan status based on the U.S. Department of Agriculture’s rural-urban continuum codes and conducted analyses separately for each stratum. 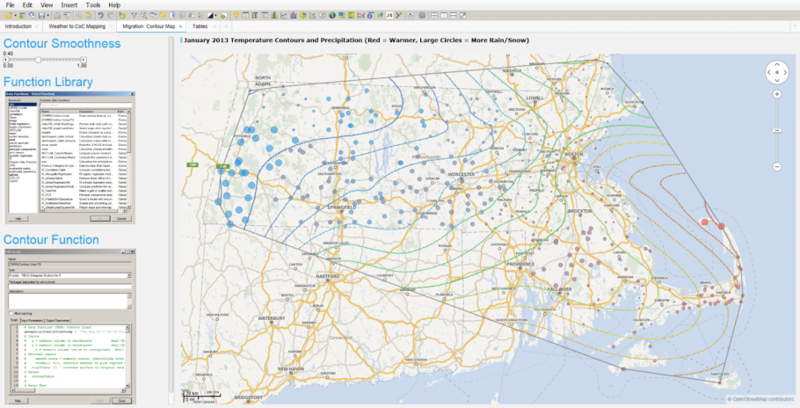 In turn, the forecasting tool is based on the results of the models estimated for the metropolitan CoCs. The results for the models that were estimated for each outcome variable (which were all log-transformed) and in each domain are provided below. The unstandardized regression coefficients are shown for each variable, and these unstandardized coefficients served as the weights in developing the forecasting tool. Given that the outcome variables are log-transformed, the regression coefficients can be interpreted as follows: the outcome variable changes by 100*(coefficient) percent for a one unit increase in the predictor variable while all other variable in the model are held constant. For example, a one unit increase in the number of age adjusted deaths due to homicides per 100,00 people is associated with roughly a 4.8% increase in the number of total homeless veterans per 10,000 veterans. It is important to note that not all of the predictor variables were found to be statistically significant at the p<.05 level in every model, but that the all variables (regardless of their level of significance) were used in developing the forecasting tool. We are always working towards our goal to end homelessness as we know it in the Fairfax-Falls Church community. Reflect the outcomes of the community's 10-Year Plan to Prevent and End Homelessness. Highlight the community's collective successes and challenges. Depict the tremendous need that exists in the community. Of the 2,982 people who were literally homeless, 714 secured permanent housing. The number of people in the Fairafax-Falls Church community who became homeless for the first time dropped 16% in the last year. Collective efforts are now focusing on the creation of 2,650 new affordable housing units. Progress toward 10-Year Plan goals and overview of homelessness. Helping our most vulnerable neighbors obtain housing. Community's collective efforts to keep people in their homes. Winter seasonal programs, healthcare for the homeless and PATH outreach. Shelter and housing programs for individuals and families, survivors of domestic violence and unaccompanied youth. Businesses, nonprofits, faith-based communities and government agencies working together. Looking ahead and getting involved. On the night of January 29, 2014 there were 1,225 people who were literally homeless in the Fairfax-Falls Church community. This represents a 9% reduction from the number counted in January 2013, or 125 less people. These results demonstrate the continuing decline in homelessness as evidenced in the chart below. The total decrease in the homeless population from 2008 to 2014 is 33%. Adoption of housing first and rapid rehousing models, heightened prevention efforts, prioritizing housing for the longest and most vulnerable homeless through the 100,000 Homes campaign, additional VASH vouchers, dedication of new housing options to the chronically homeless, and the opening of Mondloch Place have assisted in this significant reduction. The results would be even more substantial if additional housing options were available. The reduction in homelessness will not continue at the same pace in the future without significant increases in the availability of affordable housing. During the past year, the count of people experiencing homelessness in the Fairfax-Falls Church Community declined by nine percent (125 people) from the number counted in January 2013. Persons in families decreased by seven percent (52 people) compared to 2013. The number of single adults decreased by 12 percent (73 adults) compared to 2013. 55 percent of single individuals who were homeless suffered from serious mental illness and/or substance abuse, a slight decrease from 57 percent in 2013, and many had chronic health problems and/or physical disabilities. 196 adults were chronically homeless individuals. This is a reduction of 19 percent from 2013. 73 percent of the homeless individuals were male, the same percentage as in past years. 24 percent of single individuals who were homeless were employed, a slight increase from 22 percent in 2013. 8 percent of the single adults were reported as veterans, compared to nine percent in 2013. 66 adults were counted as unsheltered in 2014, marking 38 less than during the 2013 count. Unsheltered individuals comprised 12 percent of total single adults compared to 17 percent in the 2013 count. 33 percent of all persons who were homeless were children under the age of 18, the same percentage as the last two years. 78 percent of the adults in homeless families are female. The number of adult men in families increased from 18 percent in 2013 to 22 percent in 2014. 59 percent of adults in families that were homeless were employed. In 2013, 58 percent of adults in families were employed. 33 percent of all persons in families were homeless due to domestic violence, an increase from 27 percent in 2013. 62 percent of the homeless people in families were in a transitional housing program. 38 percent were being provided emergency shelter. 19 fewer families were homeless in 2014 compared to 2013, with 52 fewer people, including 45 fewer children and 7 fewer adults. The Point-in-Time count was conducted on January 29, 2014 in coordination with the entire Metro DC region. The annual count is conducted consistent with the guidelines from the U.S. Department of Housing and Urban Development, and covers people who are literally homeless – those who are in shelters, in time-limited transitional housing programs, or unsheltered and living on the street. Conducting the enumeration requires extensive efforts by a wide range of community partners, involving dozens of staff and volunteers from public and private nonprofit organizations that work with people who are homeless in the Fairfax-Falls Church community. The Department of Housing and Urban Development (HUD) collects data on homelessness from the US and releases two annual reports to Congress called the Annual Homelessness Assessment Report (AHAR), Parts 1 and 2. Part 1 contains information from the annual Point-in-Time Counts (PIT) conducted by communities nationwide on a single night in January. Part 2 includes information obtained from homeless shelters throughout the course of an calendar year—the Homeless Inventory Count (HIC). Raw data is available online at http://data.hud.gov. We obtained PIT and HIC data for 2007-2013 as part of a bake-off with Qlikview, Tableau, and SAS at the annual Gartner BI conference in Las Vegas. The HIC and PIT data are yearly measures across 473 spatial regions in the US—CoC’s (Continuums of Care). Estimates of homeless veterans are included beginning in 2011. HUD partners with the VA on the Veterans Homelessness Prevention Demonstration Program. Our analysis shows that from 2007 to 2013 homeless rates and bed utilization have dropped across the US. In 2013, the average bed utilization across the US was approximately 84%. However, there are still many states and regions that have high homeless rates and high bed utilization. 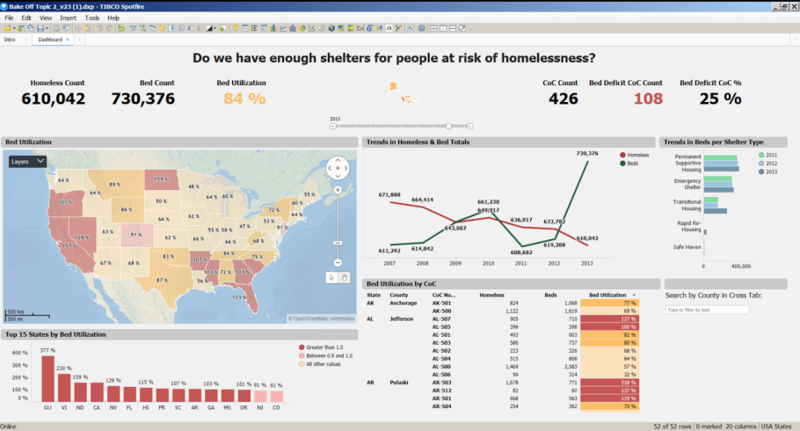 The TIBCO Fast Data platform can trigger these analyses automatically, and via notifications and alerts, can help the homeless population obtain shelters and services from existing capacity in the system. Dr. Jill Khadduri, Abt Associates and Dr. Dennis Culhane, National Center on Homelessness among Veterans, University of Pennsylvania. 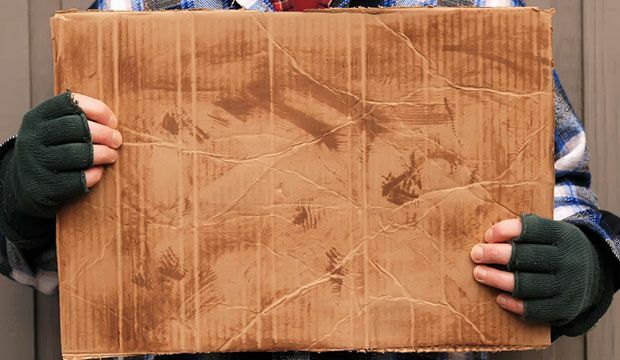 In January 2014, 578,424 people were homeless on a given night. Most (69 percent) were staying in residential programs for homeless people, and the rest (31 percent) were found in unsheltered locations. Nearly one-quarter of all homeless people were children under the age of 18 (23 percent or 135,701). Ten percent (or 58,601) were between the ages of 18 and 24, and 66 percent (or 384,122) were 25 years or older. Homelessness declined by 2 percent (or 13,344 people) between 2013 and 2014 and by 11 percent (or 72,718) since 2007. In January 2014, 362,163 people experienced homelessness as individuals (63 percent of all homeless people). There were 216,261 homeless people in families on a single night in January 2014, accounting for 37 percent of all homeless people. Homelessness among individuals declined by 2 percent (or 7,408) between 2013 and 2014, and by 13 percent (or 53,434) between 2007 and 2014. Homelessness among people in families declined by 3 percent (or 5,936) between 2013 and 2014, and by 8 percent (or 19,284) between 2007 and 2014. In January 2014, 84,291 individuals and 15,143 people in families were chronically homeless. Chronic homelessness among individuals declined by 3 percent (or 2,164) over the past year, and by 30 percent (or 36,197) between 2007 and 2014. In January 2014, 49,933 veterans were homeless on a single night. Just fewer than 10 percent (4,722) were women. Between 2013 and 2014, homelessness among veterans declined by 11 percent (or 5,846). Homelessness among veterans declined by 33 percent (or 24,117) between 2009 and 2014. There were 45,205 unaccompanied homeless children and youth on a single night in 2014. Most (86 percent or 38,931) were youth between the ages of 18 and 24, and 14 percent (or 6,274) were children under the age of 18. Continuums of Care (CoC) are local planning bodies responsible for coordinating the full range of homelessness services in a geographic area, which may cover a city, county, metropolitan area, or an entire state. Chronically Homeless People in Families are people experiencing homelessness in families in which the head of household has a disability and has either been continuously homeless for a year or more or has experienced at least four episodes of homelessness in the last three years. Chronically Homeless Individuals are unaccompanied homeless individuals with disabilities who have either been continuously homeless for a year or more or have experienced at least four episodes of homelessness in the last three years. Emergency Shelter is a facility with the primary purpose of providing temporary shelter for homeless people. Individuals are people who are not part of a family during their episode of homelessness. They are homeless as single adults, unaccompanied youth, or in multiple-adult or multiple-child households. Other Permanent Housing is housing with or without services that is specifically for formerly homeless people, but that does not require people to have a disability. Rapid Rehousing is a housing model designed to provide temporary housing assistance to people experiencing homelessness, moving them quickly out of homelessness and into permanent housing. Permanent Supportive Housing is designed to provide housing and supportive services on a long-term basis for formerly homeless people, who have disabilities. People in Families are people who are homeless as part of households that have at least one adult and one child. Point-in-Time Counts are unduplicated one-night estimates of both sheltered and unsheltered homeless populations. The one-night counts are conducted by Continuums of Care nationwide and occur during the last week in January of each year. illness and are limited to serving no more than 25 people within a facility. Sheltered Homeless People are individuals who are staying in emergency shelters, transitional housing programs, or safe havens. Transitional Housing Program provides homeless people a place to stay combined with supportive services for up to 24 months in order to help them overcome barriers to moving into and retaining permanent housing. Unaccompanied Children are people who are not part of a family or in a multi-child household during their episode of homelessness, and who are under the age of 18.
homelessness and who are between the ages of 18 and 24. Unsheltered Homeless People are people who stay in places not meant for human habitation, such as the streets, abandoned buildings, vehicles, or parks. In June 2010, the Administration released Opening Doors: Federal Strategic Plan to Prevent and End Homelessness, a comprehensive plan to prevent and end homelessness in America. With Opening Doors, the Administration set forth a bold agenda to prevent and end homelessness with four core goals as its focal point. The U.S. Department of Housing and Urban Development and its Federal partners have engaged in unprecedented collaborations and partnerships with Federal, State and local partners to work towards meeting these critical goals. While these efforts have resulted in significant progress, the latest national estimates also remind us that hundreds of thousands of Americans each year are homeless. In January 2014, more than 84,000 individuals experiencing homelessness were reported as chronically homeless (84,291 people), and almost two-thirds of them were living on the streets (63 percent or 53,088 chronically homeless people). The number of individuals experiencing chronic homelessness declined by 21 percent, or 22,892 people, between 2010 and 2014. In January 2014, there were nearly 50,000 veterans experiencing homelessness (49,933), including almost 5,000 women (4,722). The number of homeless veterans declined by 33 percent (or 24,837 people) since 2010, and most of the decline was in the number of veterans staying in unsheltered locations. In January 2014, more than 216,000 people in families experienced homelessness (216,261), including more than 194,000 homeless children and youth. An additional 45,205 homeless children and youth experienced homelessness on their own, roughly 8 percent of the total homeless population. Year-to-year changes in family homelessness have been uneven. However, since 2010 the number of homeless people in families has declined by 11 percent (or 25,690 people). In January 2014, more than 578,000 people were homeless on a single night (578,424), with most staying in the nation’s shelter system (69%). The percentage of homeless people who are unsheltered decreased from 40 percent in 2007 to 31 percent in 2014. Overall, homelessness has declined by more than 62,000 people since 2010 (62,042), a 10 percent reduction since the release of Opening Doors. The Department of Housing and Urban Development (HUD) releases the Annual Homeless Assessment Report to Congress (AHAR) in two parts. Part 1 provides Point-in- Time (PIT) estimates, offering a snapshot of homelessness—of both sheltered and unsheltered homeless populations—on a single night. The one-night counts are conducted in late January of each year. The PIT counts also provide an estimate of the number of homeless persons within particular subpopulations, such as chronically homeless people and veterans, as well as counts of people in specific age ranges. This report also provides counts of beds in emergency shelters, transitional housing programs, safe havens, rapid rehousing programs, permanent supportive housing programs, and other permanent housing. In 2014, the PIT estimates of both homeless people and beds were reported by 414 Continuums of Care (CoC) nationwide, covering virtually the entire United States. While sheltered counts are mandatory each year, unsheltered counts are required every other year. Unsheltered counts were not required in 2014. Nonetheless, 323 CoCs (or 78 percent of all CoCs) reported unsheltered counts in 2014. For the CoCs that did not report unsheltered counts, the unsheltered counts from 2013 were rolled over into 2014. HUD has standards for conducting the PIT counts, and CoCs use a variety of approved methods to produce the counts. HUD reviews the data for accuracy and quality prior to creating the estimates for this report. The PIT estimates from 2007-2013 are slightly lower than those reported in past AHARs. The reduction reflects an adjustment to the estimates of unsheltered homeless individuals submitted by the Los Angeles City and County Continuum of Care. The adjustment removed: 20,746 from 2007 and 2008; 9,451 people in 2009 and 2010; 10,800 people in 2011 and 2012; and 18,274 people from 2013.